by providing features such as user targeting, webpage notification, and Deep Link. Before registering notification popups, a popup space where they will be displayed must be created and secured. 1-1. 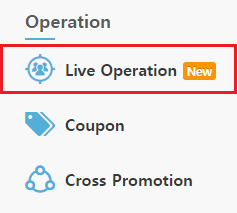 Select Live Operation, a targeting-based operation solution. 1-2. Select Notification Popup > Register Notification Popup in the Live Operation menu. 1-3. Create a popup space. Click the Add New Pop-up Space to create a location where popups can be displayed. 1-4. Clicking the Add New Pop-up Space button brings up another popup for more space. Enter the required information for each section. Click the Save button to create a popup space. Name: Enter the name of the popup space to use for the admin. Maximum of 25 characters. 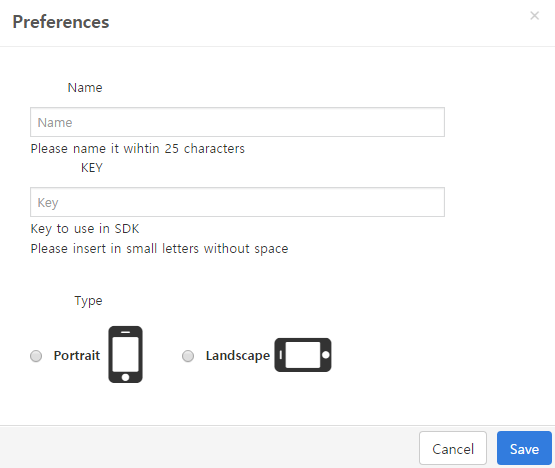 Key: Enter the key value to use when integrating the SDK. Enter the lower-case English characters without spaces. Notification Type: Select the type of notification according to the display settings of the app (Portrait-Vertical View, Landscape-Horizontal View). 1-5. After a popup space is created, proceed with the SDK sync based on the key value. Go to Preferences > Push Set up/In-app Notice on the screen to verify if the corresponding popup space has been integrated properly. : Double checks the integration status of the popup space. Integration checks are run every 10 minutes. : Edits the name and notification type of the selected popup space, excluding the key value. : Deletes the selected popup space. The process can't be undone so proceed with caution. : Opens the SDK integration guide in a new window. : Opens the SDK download page in a new window. 1-6. If SDK was integrated successfully with the popup space, click the Add Pop-up Notice button to create one. Notification popups can be created in the corresponding popup space. 2-1. Receiver: Select a user group that will receive a notification popup. Users that belong to the selected user group are calculated in real-time to verify the expected recipients. All Users: Sets every user who uses the app as recipients. User Group: Sets your current user groups as recipients. Manual Selection: Manually selects the user data value set while integrating SDK as recipients. 2-2. 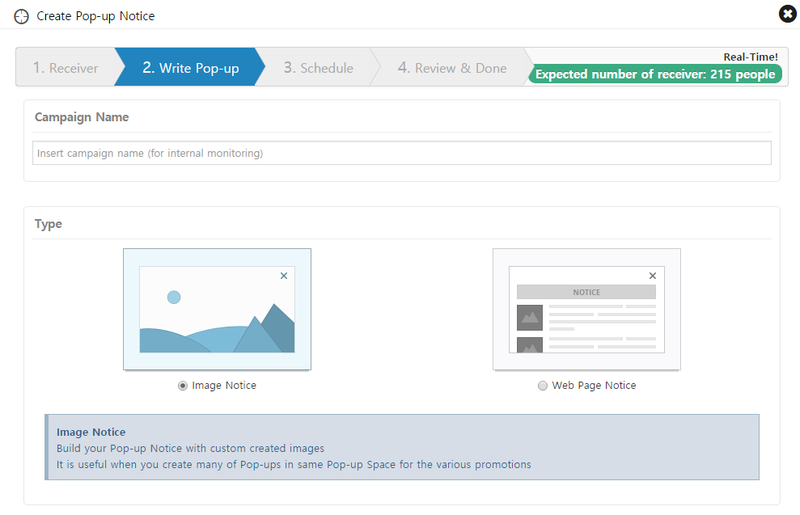 Write Pop-up: Sets the name and type of a notification to be registered. Campaign Name: Register the name of a campaign to use for the admin. Notification Type: Select the type of notification to register. - Image notification: Notifications consisting of images. - Webpage notification: Notifications consisting of web views. 2-3. Compose Notification: Add contents according to the type of notification to register. Register Image: Images should be in JPG or PNG format with a resolution of 100 kb or less. 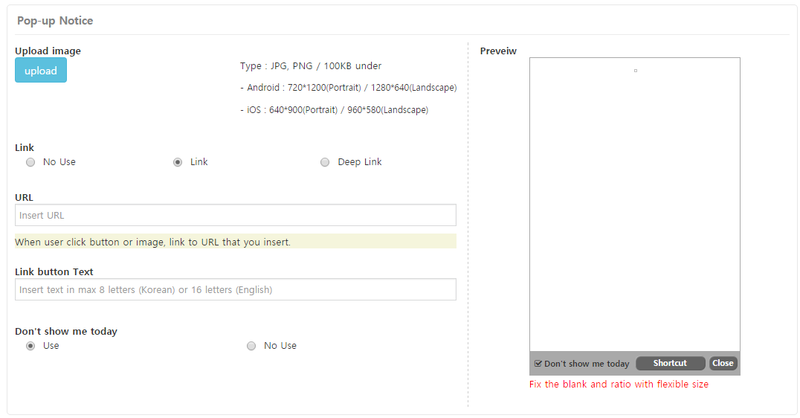 Set Link: Establishes a link to execute when clicking the image or link button. - Disable: The link button will not be provided and images can't be clicked. - Link: URL forms are available. Touch the image/link button to move to the corresponding page. - Deep Link: Select the pre-set Deep Link here. Touch the image/link button to move to the corresponding page. Link Button Text: Compose texts to be displayed in the link button. Limited to 16 English characters. Don't Show This Again Today: Enable or disable this option. URL: Enter the URL address of the webpage to register. If it is a notification, no preview will be available. 2-4. 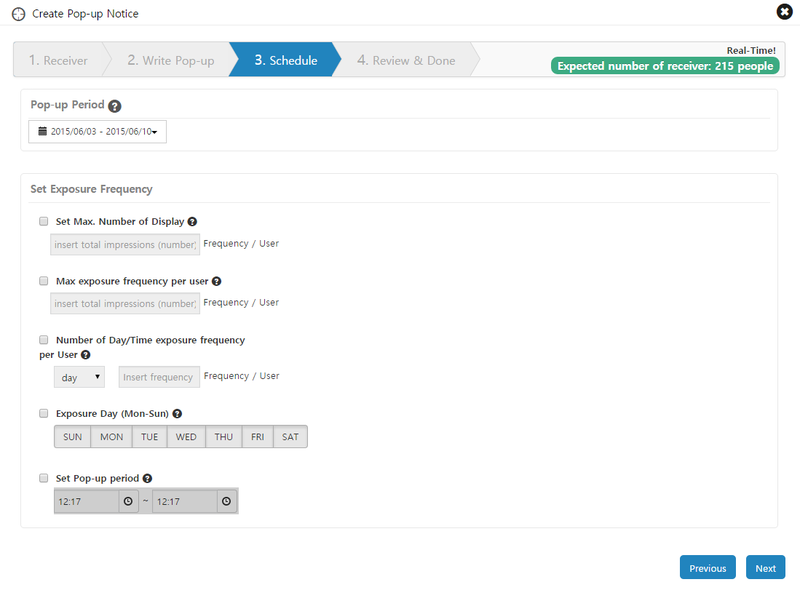 Schedule: Enter the period to display the selected notification and set display limit. Pop-up Period: Sets a duration for displaying the selected notification. Set Max. Number of Display: Sets the maximum number of displays to each user during the notification period. In order to display only once per user, set the maximum display number as '1'. Number of Day/Time exposure frequency per User: Sets a daily/hourly display frequency per user. Exposure Day (Mon-Sun): Sets a specific day to display the notification during the set duration. Set Pop-up period: Sets a specific time range to display the notification during the set duration. 2-5. Review & Register: Proceed to the review/registration process on the prepared notification popup. After this review process is completed, register a test and proceed to authenticate registration. : Click this button to move to the selected position and edit the set details. : Brings up the page to register and set a test device. : Registers the selected notification as a test. 2-6. Register Notification: Any and all notification popups should be tested before registration. 2-6-1. Test Registration: Click the Test Registration in the Review & Register page. 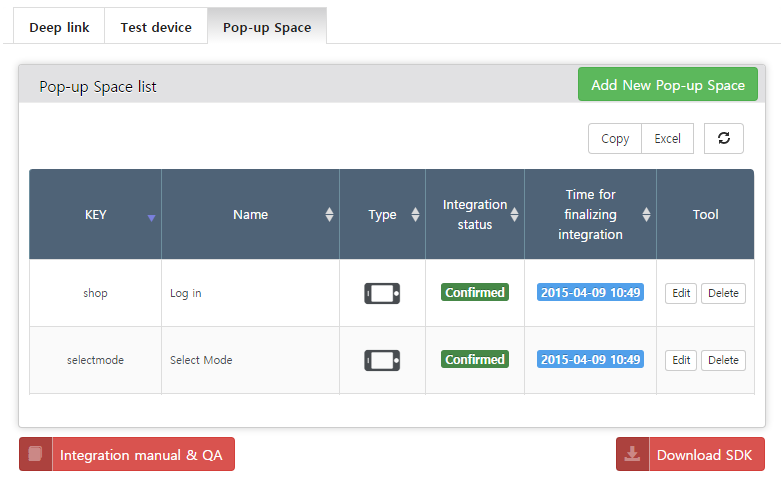 Notification popup will be displayed in the test device set during the test registration process for final confirmation. 2-6-2. Real Registration: After the test registration is done, click the Finish button to finish authenticating registration. 2-6-3. Notification Report: Notifications that were tested and registered can be verified in the notification reports. If it only completes up to the Test Registration stage, the Test will be displayed in the notification report. 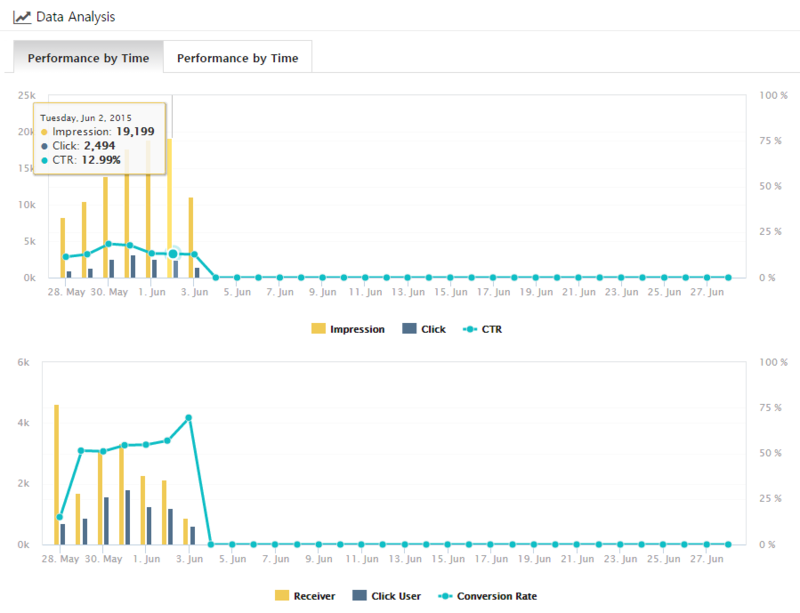 Verify the cumulative/daily/hourly analytics on all notifications. 3-1. Go to Pop-up Notice > Pop-up Notice Report to verify the status of all notifications. Notification Category: Classified into 4 types according to the status. - Waiting : Notification is scheduled for display. - Live : Notification is currently displayed to users. - Hold : Live/standby notifications are temporarily closed. - Stop : Terminated or notification period has ended. : Displays the settings of the user group that is shown with the selected notification (This features is not available when all users are selected). 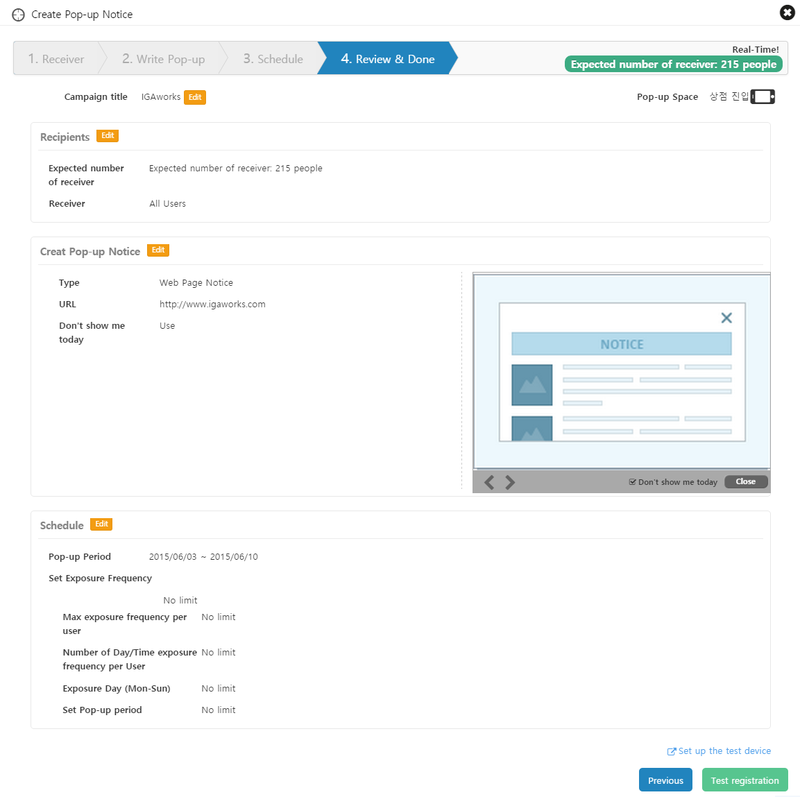 : Provides data by date and time on the display, clicks, notified users, and clicking users . : Edits the selected notification. : Terminates the ticked notification. Verify the closed notification from the Stop tab. 3-2. Click the button in the selected notification to verify more detailed data cumulatively, daily and hourly. 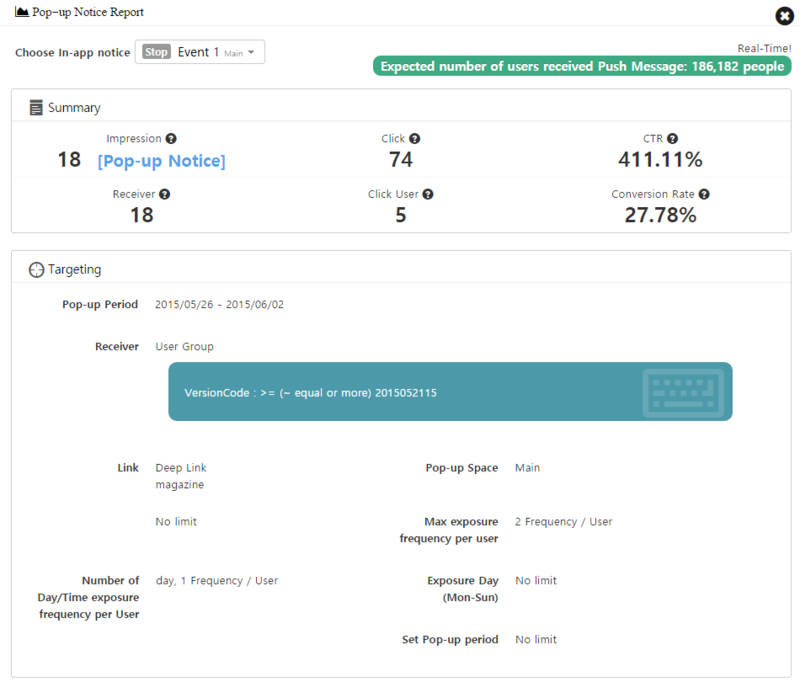 Expected number of users received Push Message: Number of users who belong to the targeting group for the notification popup. It is based on the previous day's data. Impression: The total number of notification popup being displayed. Move the cursor over [View Notification] to preview. Click: Number of clicks on the notification popup. It is not available if a link wasn't provided. Receiver: Displays a unique value of users who were displayed with the notification popup. Click User: Displays a unique value of users who clicked the notification popup. Targeting: List of options of the selected notification popup such as targeting, schedule, display limit, etc. 3-3. In the bottom of the detailed report, the daily/hourly data of that notification is available. Performance by Date: Data gathered during the notification period on a daily basis. Performance by Time: Data gathered on the selected day on an hourly basis. Change the order of notification displays and statuses that are active, pending, or temporarily closed. 4-1. Go to Notification Popup > Manage Notification Popup page to manage notifications by popup spaces. You can edit the order of display, status, and notification messages by popup spaces. : Change the order of notifications by clicking and dragging this button. : Clicking this button brings up the drop-down menu. You can change the status here. To register an image notification popup, it should be registered according to the OS and notification type.